Ah, so we see that you're suiting up as a Dog Napper for Halloween. We don't mind the idea of that, so long as you limit your deviousness to costume fun, and don't actually have any kidnapping plans in mind. So long as that's the case, we're happy to outfit you just right! So, do you have your checklist together? You know, wild hair. A black dress. And a cigarette holder. There is, of course, one other very important item on the said checklist, and we have an exemplary example of it right here. 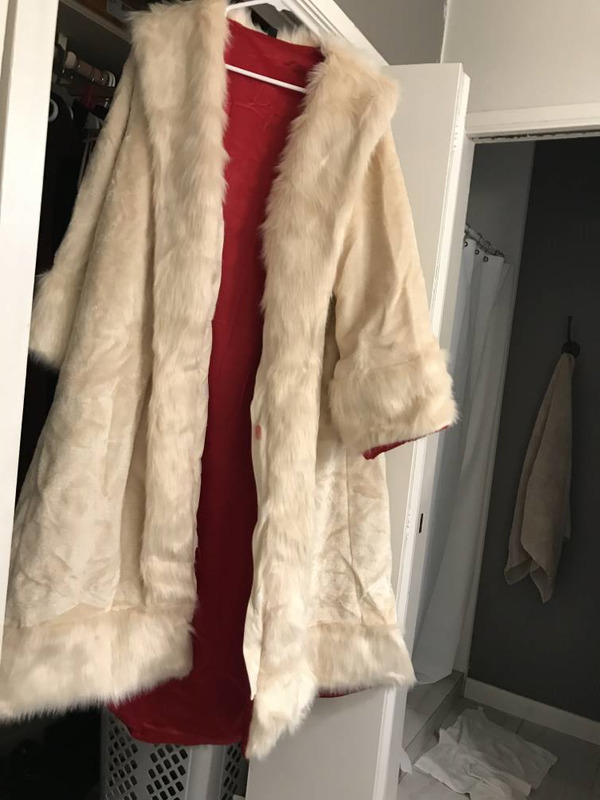 This Dog Napping Diva Deluxe Coat! 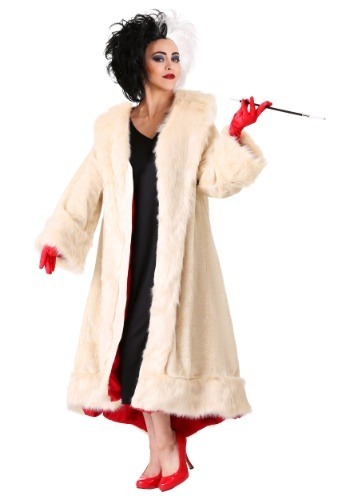 Naturally, a thick fur coat is important to your story, so you're going to want to add this Deluxe Coat to your ensemble. It's 100% polyester, made with faux fur and satin fabrics. 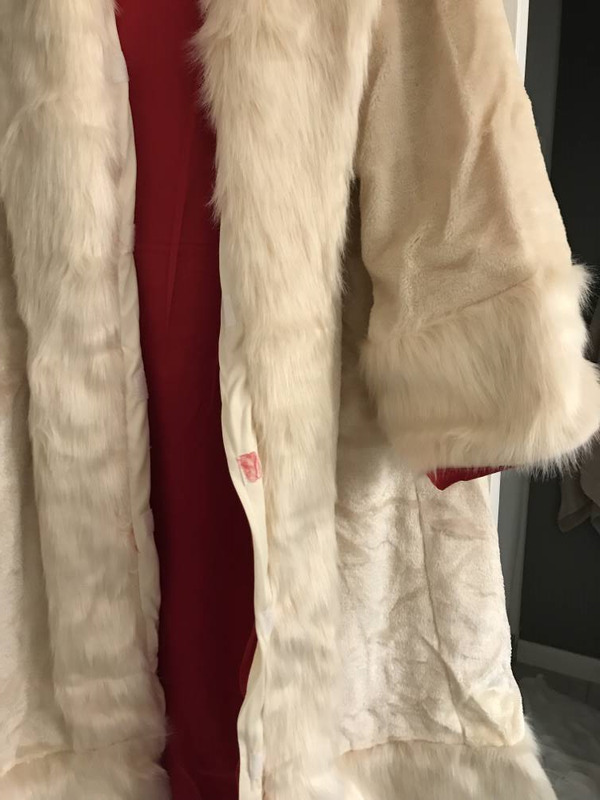 The fleece exterior is cream, and it has long faux fur accents on the lapels and cuffs, complete with a shawl that hangs on the back that even has some cute little tails attached. (Fully synthetic, no creatures were harmed in it's making!) 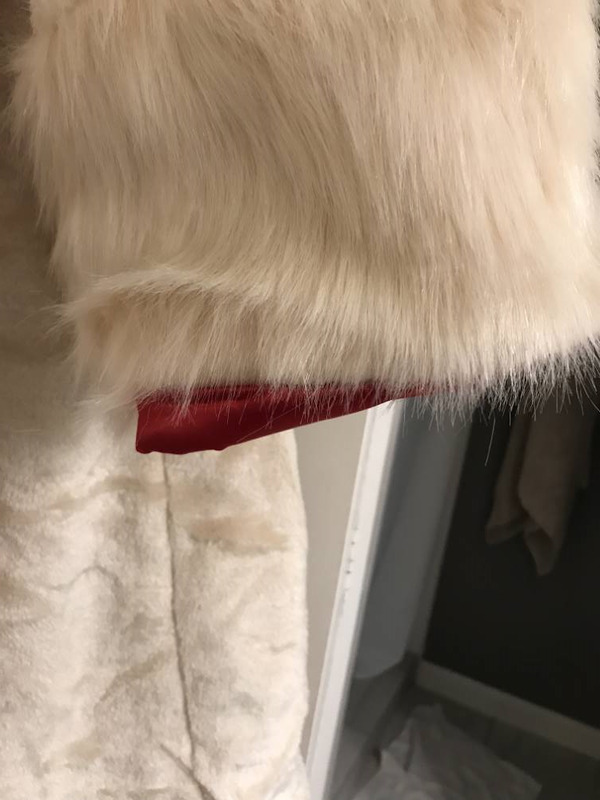 The jacket is fully lined in red satin. It secures in the front with hook and loop fastener strips, but you can leave it hanging open, too, to show off your full diva style. We're sure you'll be able to pull together that devious diva style with ease. Just, please, keep your plans for fun only, though, and no actual dog napping shenanigans! Of course, unless it's your own kiddo's just dressed up in Dalmation costumes. And if that's the case, we've got costumes for them, too. Be sure to check out our entire selection! I typically do not write reviews but I was disappointed when I got this jacket today. I was really looking forward to getting this jacket for my Halloween costume. The coat itself is sturdy. 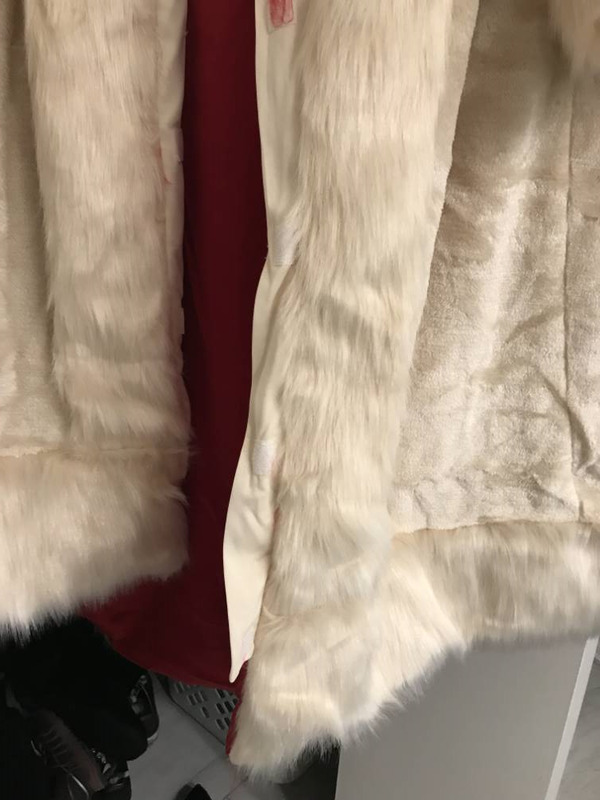 At first glance, the jacket looked decent but once I put It on, I noticed the inner red lining hung down over the hem and over the sleeves of the jacket, almost as if there was too much fabric. The hem itself is also uneven. There is an odd inner piece of material with Velcro attached which I am assuming is meant to keep the jacket closed but if you want the jacket open, this fabric hangs out, does not lie flat and looks odd. I will need to sew this fabric down so it is not visible. I paid 80 dollars for this jacket and expected it to be nicer in quality compared to other costumes.